Absa Top 10 Pinotage: Celebrating the cream of the crop! Whether you like it or not, you can never ignore pinotage. Many people love it, and for very good reason, and they will be looking at the 2018 Absa Top 10 Pinotage results to find out which winemakers have excelled in making this truly iconic South African red wine. For the 2nd year producers were invited to submit pinotage wines older than 10 years for the Museum Class category. One of the judges, Samarie Smith, said the quality of the wines in this category was phenomenal, with judges giving near-perfect scores for some of the wines. 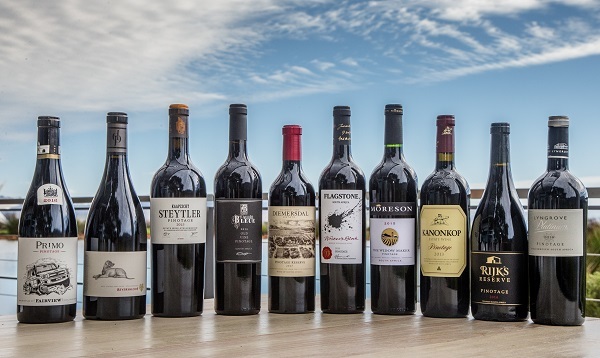 A record number of 161 entries were received for the 2018 Absa Top 10 competition and nearly half of the 20 finalists are from vineyards from the Stellenbosch area, including the iconic Beyerskloof, Kaapzicht, Kanonkop and Lanzerac. The other finalists originate from Breedekloof, Piekenierskloof, Durbanville, Cape Town, Paarl, Darling and Worcester. Four of the finalists had two wines in the running, namely Diemersdal, Kaapzicht, Môreson and Kanonkop. The 2018 Absa Top 10 winners consist mostly of wines produced by winemakers with solid pinotage track records, all with a common goal: to produce the ultimate pinotage ‘masterpiece’. Kanonkop Estate made history in notching up a Top 10 win for the 13th year, with three-time IWSC International Winemaker of the Year, Abrie Beeslaar. Rijk’s from Tulbagh is also a constant performer in the competition, scooping their 12th Pinotage trophy this year. With their The Widow Maker 2015, Môreson has now won five Pinotage trophies. Flagstone of Somerset West bagged no less than six trophies to date for their Writer’s Block Pinotage. Beyerskloof has notched up 8 trophies in the competition with their Diesel Pinotage 2015. The Diemersdal 2017 received the nod from the judges and is the only Top 10 winner from the Durbanville region. Allée Bleue’s Black Series Old Vine Pinotage 2016 from the Piekenierskloof is the first Old Vine Project wine to walk away with a coveted Absa Top 10 trophy. The Fairview Primo Pinotage 2016 flies the flag for Paarl and is one of eight finalists from the 2016 vintage. Lyngrove and Kaapzicht complete the list of winning wines from the Stellenbosch region with their Lyngrove Platinum Pinotage 2016 and Kaapzicht Steytler Pinotage 2015 respectively.